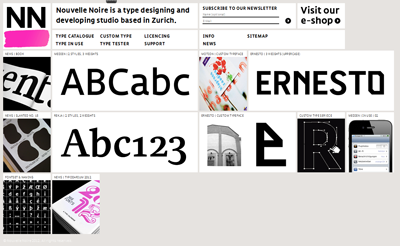 „Nouvelle Noire is a type design and development studio based in Zurich, Switzerland. It is a platform for presentation and distribution of typefaces, with a design emphasis on modern techniques and technical options. With that in mind, typefaces are developed with the consciousness of type history in unison with a forward thinking vision for contemporary type design. The main focus of Nouvelle Noire is directed on text typefaces but Nouvelle Noire is also open minded to experimentation and on experimental typefaces. Nächster Beitrag:TypoLogo – Mit Zeichen Zeichen setzen!